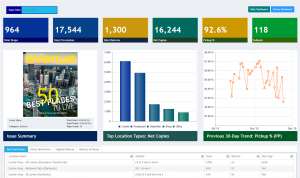 Distribution Deputy is Data2Decision.com’s latest offering, allowing publishers and distributors to monitor and optimize their newspaper distribution network. This web-based software is efficient, affordable and you can try it for free. Distribution Deputy is a newspaper circulation software solution aiming to help those who have a business in the press domain. It is based in Calgary, Canada; it was officially launched in 2007 and aims to streamline the process of distributing newspapers. In case you own a press company or you are in charge of managing the distribution network, you should know that the piece of software they offer was created in order to facilitate newspaper delivery, increase profits and boost sales. As you can see, this newspaper circulation software may be exactly what you need for a better circulation management. Lately, the need for fast and accurate information has been growing, which is why the print media market needs to improve its methods in an effort to meet its “consumers’” expectations. To this end, Data2Decision has come up with this innovative software, optimizing the circulation activities of those who need it, namely the publisher and distribution manager. The newspaper circulation software, Distribution Deputy, can streamline the circulation of your newspapers, helping you to make sure they reach available readers. The newspaper circulation software has more than one benefit, and you will find them out if you continue to read this article. Optimizing distribution is maybe the biggest and clearest advantage. The newspaper circulation software works very simply: it centralizes and analyses KPIs (key performance indicators), thus delivering you the relevant data you need: the number of items sold, the returns and so on. This way, you can spend time solving the potential problems, instead of creating them. Another benefit publishers have by using this application is that they can increase the number of readers, or readership. The application calculates how many papers were delivered, how many were sold and how many should be further sent to a certain selling point. This way, all your readers will have access to the material, and you will also find out which are the points that bring you the most revenues. Since you will know exactly the returns number, you will decrease the distribution in certain points, and thus avoid printing useless copies: so no more money wasted on printing or recycling paper. All in all, if you are looking for the best newspaper circulation software, the one created and provided by Data2Decision seems to be the best solution. It is extremely efficient, because it works fast and offers great results, not to mention the affordable prices you would have to pay to get it. In case you want to find out more about it, you can visit the official page of the company, a comprehensive and resourceful online platform. In addition to this, the company also gives you the possibility to test the application for free for four weeks. This way, you can convince yourself that the piece of newspaper circulation software is worth your investment. Editor’s Note: This post was originally published in November 2015 and has been updated for accuracy and comprehensiveness.